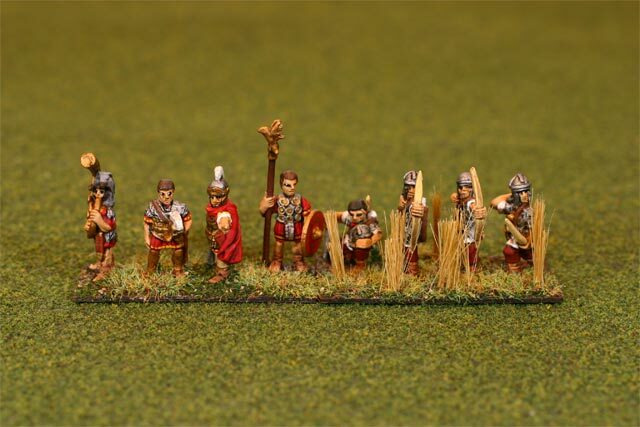 This article shows a miniature army in 15mm scale painted andbased for the miniatures game De Bellis Antiquitatis .Each army consists of 12 stands (known in the game as elements) of 2 to 4 figures per stand.The II/56 Early Imperial Roman Army representswarriors of 25 B.C. to 197 A.D. who lived and foughtat the height of imperial Roman power.This was the time of Octavian, Caesar Augustus, Tiberius, Caligula, Nero, Trajan, Hadrian,and Antoninus.Varus was defeated by Arminius.The invasion of Britain and the revolt of the Iceni.The Jewish revolt of Massada and the sack of Jerusalem.The eruption of Vesuvius.The Dacian wars.What a great time in Roman history!There is more fascinating reading at the Red Rampant Roman history siteor in numerous books such as The Penguin Historical Atlas of Ancient Rome . 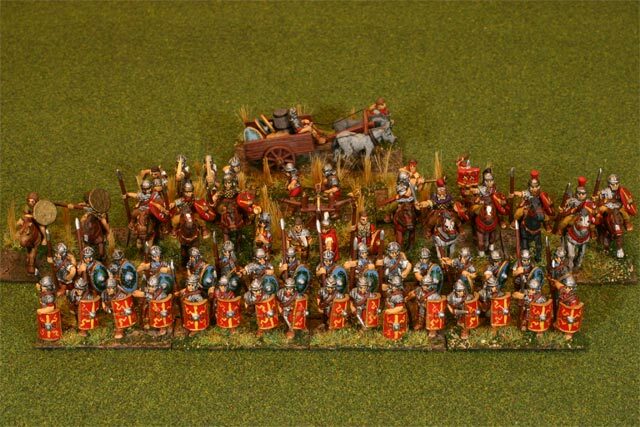 The Early Imperial Roman army has one variant with a many options.They are a very aggressive army in DBA with an aggression rating of 3and over 25 enemies to choose from.Because of all the historical opponents,many DBA players field an Early Imperial Roman army. 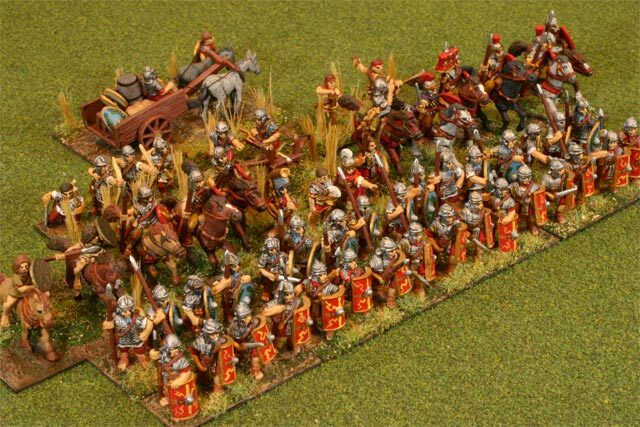 As usual in DBA, the army must have twelve stands of figures.The general can be mounted cavalry or in bladed foot soldiers.There is one mandatory cavalry and one optional cavthat can be replaced with light horse, bows, or psilois.The brunt of the army is 4 stands of bladesand 4 stands of auxilia.The final unit is the long range artillery. All the figures here are from Corvus Belli.This is the DBA box set that provides enough figures for any optionEarly Imperial Roman army listed above.The only additional models are some of the boxes and barrels in the baggage cartwhich are from Essex. 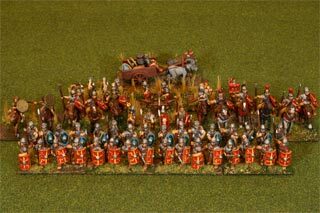 To the right are the mounted cavalry figures.The general with musician and banner are in the center.It's a nice mix of sculptures.Some of the figures have scale armor ( lorica squamata )and some have mail armor ( lorica hamata ).Most warriors have spears, but the general holds out a mighty longsword ( spatha ).He has a cape which I have painted purple, oneof the few times I think you are justified to use such a royaland rare pigment. 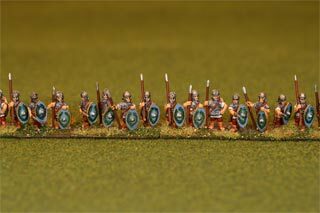 I painted the figures in my usual manner with Vallejo Acrylic paints.The bases are thin plywood from Litko Aerosystemswith flexible magnetic sheeting below to adhere them to their metal-lined. 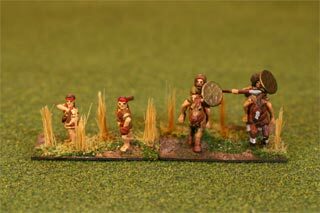 carrying case.Grass consists of flock and static grass from Woodland Scenics. 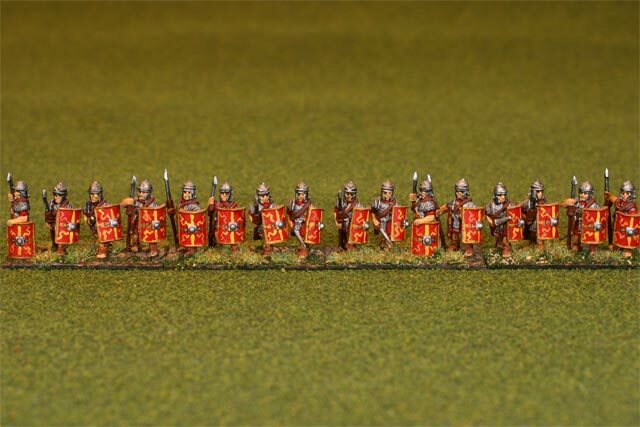 To the right are the main attack force of the Romanarmy, the bladed foot soldiers, the principles ( princeps ).They are armed with a iron tipped throwing spear (the pilum )and a short stabbing sword (the gladius ).They have the segmented metal banded armor ( lorica segmata )and an iron helmet with cheek guards and visor and tail pieces.The also have the typical cylindrical heater shield, whichwas made of plywood with a metal boss and metal edging.Each Roman legion had its own shield designs,but usually the entire group had similar tunics and equipment. As usual, to get shading of the deep recesses, I dipped my completed models inMinwax Polyshades Jacobean polyurethane.This is dark colored, inky wood stain in a plasticized clear varnish.Swap off excess dark stain with a cotton swap and let dry overnight.The poly is somewhat shiny,so I complete the base, and then I spray the figures, base, and flockingwith matte varnish.Krylon has a new formula matte varnish that is nearly as matte andinvisible as Testor's DullCote (the acknowledged best product for this purpose. )Krylon is about half as expensive as Testor's. 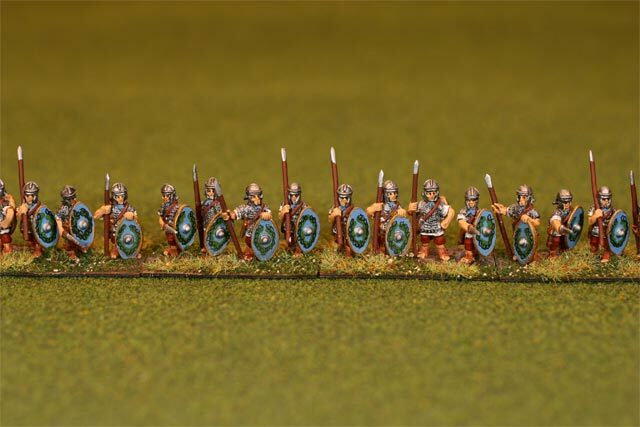 To the right are 4 stands of auxilia.These are also heavily armored foot soldiersusually created from newly conquered territories,or from citizenry outside of Rome.They have mail armor and oval shields.Corvus Belli has done a great job, and thereis a great variety of poses in the bunch.They also have nice details such as the neck scarf thatmany warriors wore to prevent the armor from chafingthe neck.Excellent authentic sandals and weaponry too. 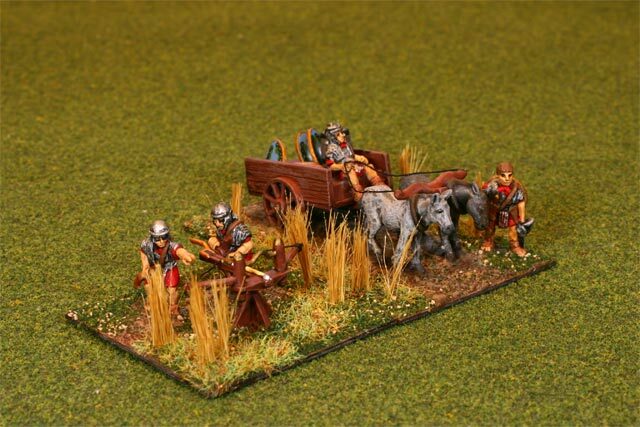 To the right is the Roman artillery ( ballista )and a supporting baggage cart.The weapon is a bolt thrower known as a scorpion ,which like the dreaded arachnid throws its stinger at its enemies.More kudos to Corvus Belli for including the baggage cart in the DBA army.You can mount the scorpion in the cart and make a mobile ballista,but I could not fit the cart on a standard artillery base of 40 by 40 mm,so I made the cart a support vehicle.I placed a few extra shields and a few stowage pieces from Essexin the back. 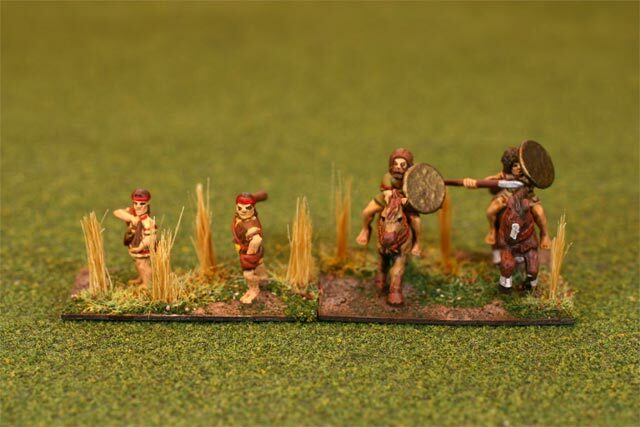 The easy way to add bow strings and reins to the small 15 mm figuresis to work in stages.Start at the middle.Use super glue to fix the middle of a black or tan thread to a figure'shand or arrow notch.Once that dries, pull the loose ends to the correct tautnessto the bow tips or the yoke.Glue those in place and let them dry.Then trim to the correct length.Don't try to trim and glue everything in one go, or else it willfall or come loose and get wet glue in the wrong places. 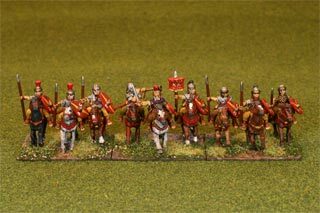 To the right are the Roman foot command and the bows.The two important looking generals have horse-hair crested helmets.There is a musician ( cornicen ) with his horn ( cornu )which is where English gets its word coronet.There is also a standard bearer with the imperial eagle standard.This man is the aquilifer .In Spanish, the word for eagle is águila . The tall sprigs of grass are fromWoodland Scenics.It looks like some sort of acrylic or polyester fiber,about the thickness of human hair.It comes in various grass colors.To make a sprig, grab a bundle of the fibers,use a scissors to clip an end,dip the bundle in dilute white glue,and press to the base.Then trim the height to whatever your like. 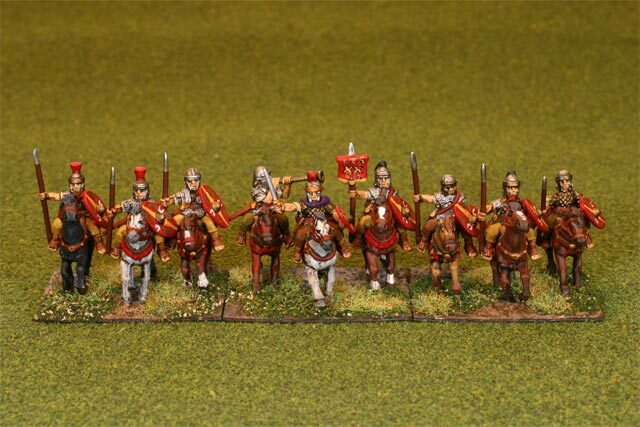 To the right are the resilient psiloi and light horse.They are great for harassing and delaying enemy formations.When attacked, they tend to fall back or flee.These troops are painted with basic tunics and farlighter equipment than the normal Roman trooper. 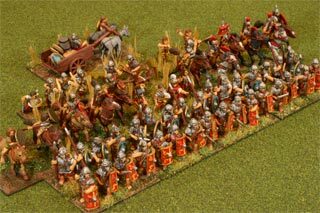 Romans, march!Here is the entire army marching forward.Note how tightly spaced are the shields of the front line.It is clear how the Roman army discipline and tacticstrampled many enemies and sent them fleeing.Forward, for the glory of Rome! 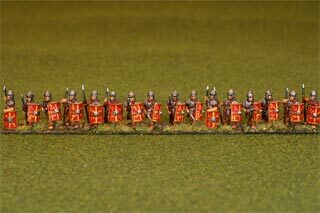 Last modified: Thursday, 09-Jun-2011 12:41:48 MST.